FILE-A tourist visits the Tuol Sleng Genocide Museum, also known as the notorious security prison S-21, in Phnom Penh March 3, 2015. In a room adorned with art and lit in a soft orange glow, more than 80 people await the launch of a new documentary on the Khmer Rouge. But unlike many films made about modern Cambodia’s greatest period of upheaval, this documentary was different. The Khmer Rouge regime, led by Pol Pot, ruled over Cambodia for more than three years, from 1975 to 1979. 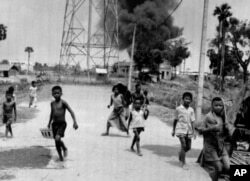 During this period, the cities were evacuated and Cambodians forced Cambodians to leave behind their sons, daughters, parents and siblings. They were also forced to farm without rest while eating little in order to create what the Khmer Rouge leadership viewed as a model society, which they called Democratic Kampuchea. Hunger, malnutrition and violence killed at some 1.7 million people, leaving the country decimated. More than 80 people last month attended the launch of a short documentary as part of the Former Khmer Rouge and Victim-Survivor Dialogues for Healing and Reconciliation Program, at Meta House. The program was organized by the Transcultural Psychosocial Organization (TPO) and funded by United States Agency International Development. Om Chariya, TPO project coordinator, said the project was created for the purpose of focusing on and fixing the relationship between survivors and surviving Khmer Rouge leaders. The 15-minute video described the process of healing and reconciliation. The first phase is assessment, where TPO staffers talk to the victims and leaders. Then, both parties decided to talk via video link. In the second stage, the survivors and Khmer Rouge leaders met face-to-face, eventually holding a religious ceremony to celebrate the healing process. After watching the documentary on the relationship between the Khmer Rouge survivors and leaders, Julie Chung, deputy chief of mission of the Embassy of the United States, said the process of healing after such trauma can take years. “All we hope for is that this dialogue will help them. Just a small step in terms of dealing with some of the emotion, the anger, the revenge, the pain, the conflict they feel till these days; their neighbors, family members, and the community members. So we hope it will heal that. Of course, it won’t erase the past. We don’t expect that at all.” she said. Heng Soviet, 28, an employee of the Youth Resources Development Program, also showed his interest in the documentary, adding that he thought the program still had room for improvement. “From the two sides of the story in the video, it helps them a lot in recovering their relationship after 30 years without meeting and talking to each other. If the video is to be widely spread, it will promote understanding and the importance of healing between the victims and leaders,” he said. Chariya also said that she would do more to spread awareness of the program. “We will take this video to promote it in other provinces. We plan to do it in six provinces, so that we screen the video in the communities of those provinces. We will screen it 5 to 6 times more,” she said. However, Ain Chean Toing, a project coordinator of Prosperity & Stability through Private Enterprise, who attended the screening, doubted whether the project could truly mend old wounds.